Spray a 2-quart casserole with cooking spray. 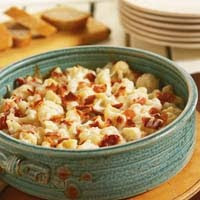 Stir the soup, milk, garlic, cauliflower and half of the cheese in the casserole. Sprinkle with the bacon and remaining cheese. Bake at 350 degrees F. for 50 minutes or until the cauliflower is tender and mixture is hot and bubbly. This entry was posted on 2:27 PM and is filed under Vegetables . You can follow any responses to this entry through the RSS 2.0 feed. You can leave a response, or trackback from your own site.